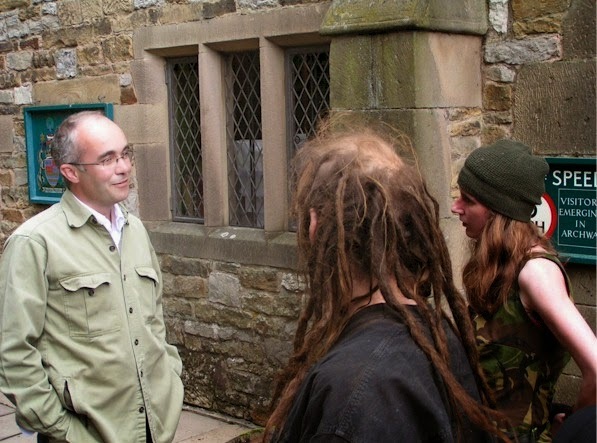 guy in the middle is Adrian from "Adrian's Images"
Evrtynehgi is almost readay at Haddon Hlal. guests have been tarriving through tehe ppast twenty sfour hours, enjoying bricuang walsk in the Darbyshire country-side. the Polish leapdancers xare here along wwith the hypnotist oand the band d- a little known combo called statujs quo. staff are adding finawl touches to the doactroneis win hbte great haxll, blowin up douzens of pink and sky blue balloooons wihle lord edawrd Manners and I hazve been chequing out tkhe bar as you May tell from these post! Hic! Time marches on but some things endure such as mountains, the ocean and the "Laughing Horse" blog awards. Rooting through the office archives, I stumbled across previous exclusive designs for the much-cherished "Laughing Horse" winners' widget. As with architectural or furniture design or fashion, these widgets reflect our changing times and no doubt bring back happy memories for so many bloggers. 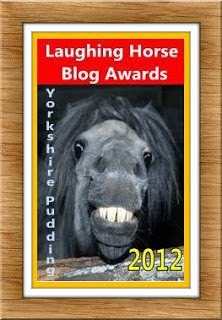 Readers must appreciate that the "Laughing Horse" committee always allocate a variety of different sub-awards for various blogging achievements. And this year will be just the same. So it will not just be the "Blogger of the Year" who is beaming with the happy glow that comes from official recognition. Meanwhile the staff at Haddon Hall are bracing themselves for tomorrow night. Huge supplies of alcohol have been brought in and several wild pigs are preparing to meet their maker in the cobble yard. You can't beat a nice slice of spit roasted suckling pig on New Year's Eve! The tension is building. 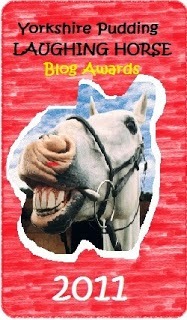 Incredible as it may seem, there are bloggers out there in the blogosphere who have never even heard of the prestigious "Laughing Horse" Blog Awards! That's like a published author who has never heard of The Booker Prize or a nuclear physicist who has no knowledge of Nobel prizes. Amazing! As most visitors to this humble blog will recall implicitly, the "Laughing Horse" blog awards have their origins in the misty far distance of blogging history. I remain honoured that the awards' chief vehicle of expression is this very blog. Why "Yorkshire Pudding" ever got the nod I have no idea. Each year an award winning designer is picked to produce a new award widget. For 2014, the well-known Milanese designer Roberto Bragezzi received the honour for the first time and I am happy to report that his unique design for the 2014 widget was received in the "Laughing Horse" offices just this morning. This year's main image which is of course the central focus of the widget is drawn from Bragezzi's exhaustive research into plastic jewellery of the early 1930's. He said, "I discovered zis vintage brooch whenna I wassa visiting upstatea New York and immediately I thought of ze Laughing Horse widget. I love ze burgundy hue which I hevva replicated in ze background." Blogging guests from around the world are already jetting into Robin Hood Airport ready for the 2014 "Laughing Horse" awards ceremony which is to be held at Haddon Hall near Bakewell on New Year's Eve. Let's hope the proceedings go more smoothly and less drunkenly than they did last year at Chatsworth House. 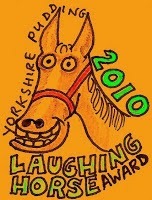 Who will be the "Laughing Horse" winners this year? Watch this space! Last year on the beach of Unawatuna in Sri Lanka, Shirley and I met a man who remembered Boxing Day 2004 very well. He was working in a beach front restaurant and it was early morning. When he woke and went down to the beach, he knew that something wasn't right. It was an eerie feeling. The tide seemed to be further out than it should have been. 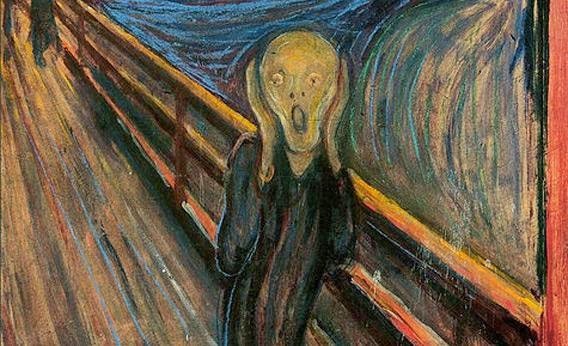 Then he heard a distant noise and saw the first tsunami wave on its way. Instinctively, he decided to race into the nearby woodland where his parents' little shack was located. He yelled at them to get up and get out. The death water was coming now. He grabbed his mother and quickly carried her up to higher ground but when he turned and tried to get back to his bleary-eyed father it was too late. The tsunami had swept in. Later that morning, he found his father's corpse floating head down above the kitchen floor. The man on the beach was probably in his early thirties. He was crouching near our beach chairs where we were drinking "Lion" beer as the sun sank peacefully over the Indian Ocean. Tears were rolling down his cheeks and we had tears in our eyes too. I put my arm around his shoulder and squeezed him because there was nothing much you could say. We felt a piece of his pain. And then he returned to his job as a hawker - drumming up business for diving expeditions in the very ocean that had claimed his father and 35,321 others along the Sri Lankan coast, hundreds of miles from the epicentre of the undersea earthquake that created that monstrous tsunami ten years ago. Afterwards, I attempted to write a poem based on the beach man's story. If you're interested, it's here. West of Sheffield, on a high ridge between the valleys of the River Loxley and the River Rivelin, there's a little windswept graveyard containing the bones of a local farming family called Shaw. They were Quakers and apparently had numerous acrimonious battles with authorities including tax collectors. I managed to get up there this morning before my Christmas Eve shift at the Oxfam shop. And I took these photos to share with you. that you can see over the numerous drystone walls. Hagenfield House. It was badly damaged by fire in 2010. 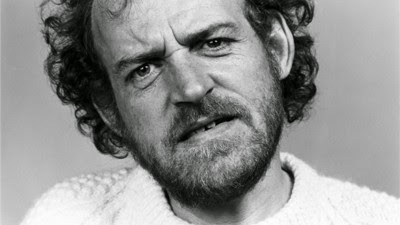 "I think I have become a mountain man"
This morning on Radio 4's "Today" programme there was brief interview with Joe Cocker's older brother Vic. They grew up in a humble terraced house in the Crookes area of Sheffield - very near the house that Shirley and I bought in 1981. 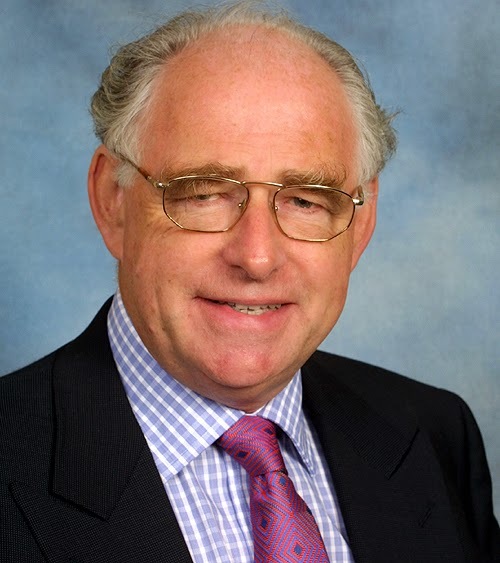 Remarkably, Vic Cocker also made a significant mark in the world, rising through the ranks of the water industry to become Chief Executive of The Sever Trent Water Authority. This water board is responsible for water and sewage services for around five million people across a large swathe of central England. Later, Vic also held other significant lead positions within the recycling industry. And all the time Joe was living the life of a rock legend. The gigs, the drugs, the booze, the women, the interviews, finally settling to a more peaceful life near Crawford, Colorado with his American wife Pam Baker. Joe once said of her, "It was Pam who helped me get myself back together, She made me think positively. I was very down on myself. She made me realise people still wanted to hear me sing, and convinced me I could escape the downward spiral." On this morning's "Today" programme Vic confirmed that Joe had found "contentment" in the last twenty years. Vic also said that he was Joe's biggest fan and just this last summer Joe told him, "I think I have become a mountain man". 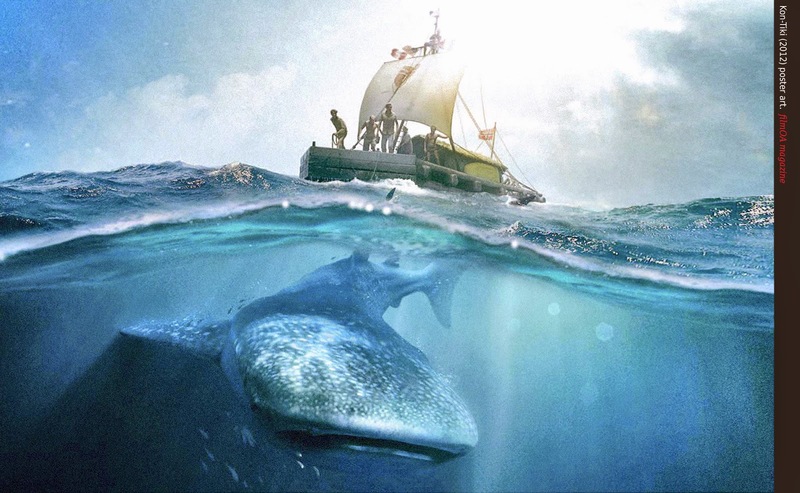 Whale shark passing under the raft in a scene from "Kon Tiki"
"Kon Tiki" is a 2012 Norwegian film directed by Joachim Rønning and Espen Sandberg. It portrays the 1947 voyage of the "Kon Tiki" raft from Peru to the Tuamotu Islands of Polynesia - a journey of over four thousand miles - propelled mostly by the South Equatorial Current. It was all a hare-brained scheme hatched by the explorer, writer and anthropologist Thor Heyerdahl - one of Norway's most famous sons. He was trying to prove that the first settlers to arrive at the scattered islands of Polynesia could have come from South America and not from Asia - which is the source theory that most informed anthropologists subscribe to. 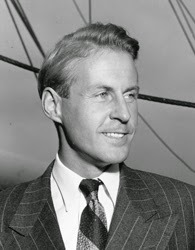 The cast and crew of six Scandinavian men of a similar age and appearance are led by Pål Sverre Valheim Hagen as Thor Heyerdahl, Their voyage includes encounters with sharks, luminous sea creatures, storms and finally a jagged coral reef when they eventually make landfall after a journey of some 4,300 miles. It has been said by other reviewers that it is a story straight from the pages of some "Boy's Own" book of adventures. In one memorable night scene when the ocean is calm, the crew are lying on deck looking up at the stars and conversing quietly about their place in the universe. The camera is looking down upon them and then, as if lifted by a balloon, the camera viewpoint rises so that the raft become a pinprick of light in the vast ocean. Then that pinprick disappears and the camera is looking out from the edge of the stratosphere upon the very curvature of the earth and the heavens beyond. 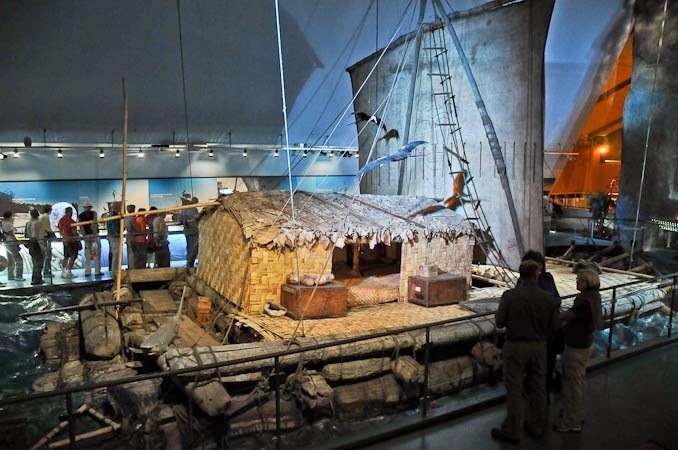 As I have said before in this blog, I have been fascinated by all things Pacific most of my life and have read all of Thor Heyerdahl's most well-known books. I have even visited The Kon Tiki Museum in Oslo which is where the famous balsa raft has resided since the nineteen fifties. It is the stuff of dreams even though Heyerdahl's underlying ethnographic theory was arguably quite mad. "Kon Tiki" was the most watched film in Norway in 2012 and I enjoyed it a great deal - mostly because I knew the story already and simply enjoyed seeing it come alive. How did they capture that scene where a massive whale shark swims under the raft? I shall probably never know. I have recently completed three four-hour shifts at one of our local Oxfam shops. It sells a range of goods from good quality second hand clothing to books and bric a brac. There's also a section where new goods are displayed including "Fair Trade" coffee and chocolate as well as greeting cards and craft products from distant lands. The shop raises around £100,000 a year to support some of the many charity projects that Oxfam are involved in around the world. 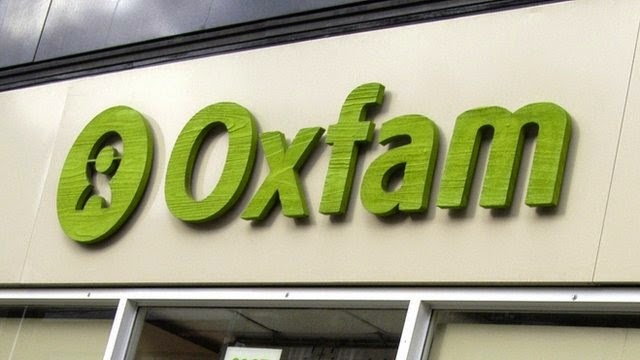 I have supported Oxfam since I was a schoolboy. My mother supported them too and at her funeral in 2007, all the money collected from attendees was donated to Oxfam. One of the very laudable things about this charity is that the majority of projects they fund are aimed at self-help. There's a big focus upon providing clean water - digging new wells, improving sanitation, setting up village pumps and so on. They are also involved in agriculture and the active encouragement of economic and gender justice. 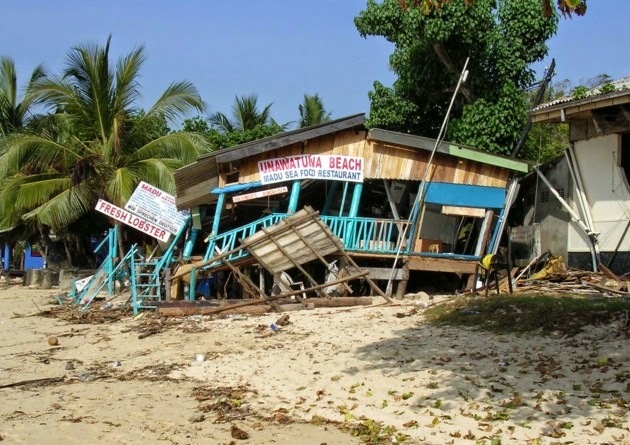 And where there are crises such as famine or flood, earthquake or hurricane disasters, Oxfam is usually there to help. Anyway - back to the shop. I had to put in an application with references and everything but at last I finally got round to it. The last till I operated was back at Butlin's, Filey in the summer of 1974 and it was nothing like the glorified computer you have to use now. There are lots of little touch-screen buttons and lots of things to remember - Credit Card or Cash? How much money has been tendered by the customer? What is the sub-total etcetera? It does my head in and my fingers are like bananas so I inevitably risk pressing the wrong button. I am scared in case the super-efficient shop manager Catherine shouts at me! I hope the needy in foreign lands are appreciative of my battle to come to terms with that damned till! I have also been upstairs sorting out books ready for sale. Some donations end up in rubbish bags -especially out of date academic doorstops. You have to decide on prices following Oxfam guidelines and place the books on appropriate shelves - Fiction, Crime and Thrillers, Children's, Teenagers, History, Biography, Antique and Collectibles, Travel and so on. This is more up my street than wrestling with that bleeping till. Last Wednesday I had to help another volunteer to cash up. Let's call him Ringo simply because he has four or five rings on each digit. And he's also got a dozen or more bracelets on each wrist. His head is shaved but with little red nicks in it and yet he has a big grey beard. Around him hangs the aroma of stale cigarettes but I admire the fellow greatly as he has mastered the electronic till so well that you might think he had invented it. In comparison I must appear like a hopeless dunce! One of the nice things about being an Oxfam shop volunteer is that I can walk away when ever I want to and at least for the time being I am only working one afternoon shift a week. I will be there on both Christmas Eve and New Year's Eve. Let's see how it goes. 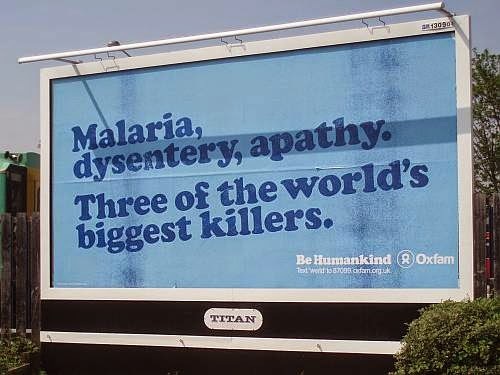 Click here for the official Oxfam site. I am sitting on the sofa with my nasty friend Gordon Gout and we are watching "Saturday Morning Kitchen" with the Yorkshire chef/presenter James Martin. In this programme, there's always a celebrity guest - such as an actor, comedian or well-known writer. He or she gets to sample the various dishes that are prepared in the studio kitchen. Early in the programme, the guest is asked to name his or her favourite food item and also their least favourite - "Food Heaven and Food Hell". Viewers and celebrity chefs get to vote on which of these will be used in the preparation of the last dish of the show - for the guest to sample. So I was thinking - if I was the celebrity guest on "Saturday Morning Kitchen" - what would be my "Food Heaven and Food Hell"? What would be yours? For "Food Heaven" I would be spoilt for nominations. There are so many food items I love - from the humble potato to mussels prised from seaside rocks and from spring lamb to brussel sprouts. My list would be almost endless. But with regard to "Food Hell", I am really scratching my head to come up with anything at all. Now over to you dear visitor. 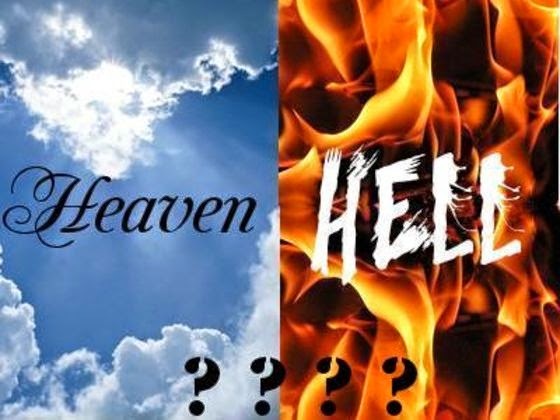 If you were the guest on "Saturday Morning Kitchen" what would your "heaven" and "hell" ingredients be? Don't tell me about pain. I have known that beast. He has gnawed at me so that nothing else was left in my head but the howling of pain. Was it sixteen years ago? Lying on a cold hospital trolley at 2am, moaning with the agony when nobody came to mop my fevered bow or to even say "There! There!" I was waiting for daybreak when a surgeon would appear to drive the dragon back into his lair. I had a urethral stricture close by the sphincter that leads to my bladder and to put it simply, I couldn't piss. The pressure was building and I thought that I would burst. It was awful. If someone had arrived at my cruelly designed high-sided hospital trolley bed with a revolver and had said "Would you like to extinguish your pain with this little baby?" I would have yelled "Yes! Yes! Give it here!" and I would have pressed the trigger close by my temple. Such was the pain. Compared with that, the successive pains I have felt this calendar year have been insignificant. And yet they have still gnawed at me, threatening to hi-jack my senses, though I have strived to simply carry on. It was back in August that I knelt awkwardly while doing a little painting job and that led to six weeks of limping like Hopalong Cassidy. And then a month ago I reached from one of our sofas to another to grab the laptop. My chest was pressed into the arm of the sofa and something went in my torso - a sudden knife in my ribs - broken or dislocatecd or maybe an injury to my right lung. It hurt like hell. I could only sleep on my back and every morning the pain gripped my chest like an invisible fist. Cue Ibuprofen and Paracetamol. Then on Sunday, pain crept into my left foot. I think it is gout but it isn't in my big toe. Like the knee it has obliged me to limp. I just want it to go away. Tomorrow will be a lovely winter's day with bright sunshine illuminating the countryside for a few hours and I would love to be rambling in the Lincolnshire Wolds near to Market Rasen. Ten miles or more of vigorous plodding but at this juncture in time that seems like pure fantasy. If you are currently pain-free dear blog visitor, be grateful and enjoy that sensation I am envious but hope that one day soon I will also know that lovely feeling again. I have had almost six months of it and I am getting fed up. One thing after another. Pain pain go away - come again some other day! Hi Folks! It's me Yorkshire Pudding and today I am making Yorkshire Fish Pie. Turn on your favourite radio station and grab a couple of medium-sized leeks. Top and tail and inspect for soil residue. Coarsely chop up the leeks and chuck in a deep frying pan where a big knob of salted butter had already been melting. Season with a little salt and a little more black pepper. Just soften the chopped leeks. Grab some milk from the fridge and pour a pint or so in a saucepan. If you prefer you can instead warm the milk in a jug in your microwave. Get a handful of plain flour and toss it over the leeks, stirring in. Then add the hot milk and stir until you have achieved a smooth creamy consistency surrounding the leeks. From the supermarket or fishmonger you bought two lumps of filleted haddock. One was plain and the other was smoked. You cut them into little chunks and squirted some lemon juice over them. Now is the time to add these fish chunks to the leeky sauce you have prepared. Blend in evenly and allow to simmer for two or three minutes. At this point you might like to add a herb such as dill or parsley - fresh is best but dried will do. Pour into a ceramic cooking dish a-la photo above. Allow to cool and then cover with cling film or aluminium foil. Whack it in the fridge for an hour or two. If you need the toilet, now is a good time to go. Remember to wash your hands. Make a medium pan of mashed potato. I shall not insult your intelligence by explaining how to prepare mashed potato but for this particular dish I will ask you to throw in a handful of grated cheddar cheese during the mashing process - maybe a little cream if you have any spare. Get the cooled ceramic cooking dish from the fridge and carefully layer mashed potato over the fishy leek mixture. Try to cover the fish. Then sprinkle a layer of grated cheddar cheese over the mashed potato topping. Pop it in a hot oven for forty minutes. You will need some green vegetable to go with your fish pie. Last night we had garden peas from the freezer but green beans or broccoli would also be good. I always steam such vegetables in te microwave. Turn the radio off and go and watch The News on television while you wait for the pie to warm through. More images from Peshwara. To assassinate schoolchildren like that - if there were a God watching over us - which of course there isn't - there is surely no way he could approve of such heartless slaughter in his holy name. The world is going mad, completely mad. Like John Lennon, all that we are saying is - Give peace a chance! But we are waiting for the next atrocity. We know it will happen - somewhere, some time, somehow. Time for fish pie methinks. Back to the kitchen. Never eat good food from your knees or lap while watching television. Eat it at a table without distraction. The best drink to accompany my Yorkshire Fish Pie is a mug of tea with milk added and sugar if you like it. Enjoy! Yesterday, rufty-tufty itinerant photo-blogger, Cap'n Adrian finally came out. Yes folks, in a kind of blogging whisper Adrian admitted that he has a favourite word and it is (drum roll)...marmalade. He likes the word - not because it is something sweet and orangey that he smears on his toast but because he likes the sound of the word. He likes the way it rolls off his tongue. If any of the no-nonsense seamen who served under Adrian (aka William Bligh) had heard about this affection for words, his ironman reputation would have plummeted like a hungry gannet descending upon a shoal of mackerel. So anyway, if Adrian can come out then so can I. (Nervous cough). If I am honest I like the sound of lots of words - from mellifluous to nincompoop and from pamplemousse (French for grapefruit) to scythe. The English language is awash with great sounding words and we all have our favourites. It is difficult for me to pick out one single "favourite word" but if pressed I would have to plump for Yorkshire, a beautiful proper noun that cascades from the mouth like the heavenly sound of angels singing in paradise. On "geograph", the British Isles photographic mapping site, over 5000 new pictures were received in Week 49. A selector called Hayley then picked fifty of those pictures for the weekly photo competition shortlist. Then the previous week's winner deliberated over the fifty entries before picking the week's winner. Clumber House to the south of Worksop in Nottinghamshire was the country residence of the Dukes of Newcastle. In their heyday, like other English aristocratic families, this particular family lived a life of privilege and ease with so much wealth that there was little they could not do. They hired the top landscape gardeners and brought in craftsmen from France and Italy as they dined on fine foods prepared by minions of servants. To some extent the obscene luxuriousness of their lifestyle was part of a nationwide competition between aristocratic families. A snobbish game of one-upmanship. 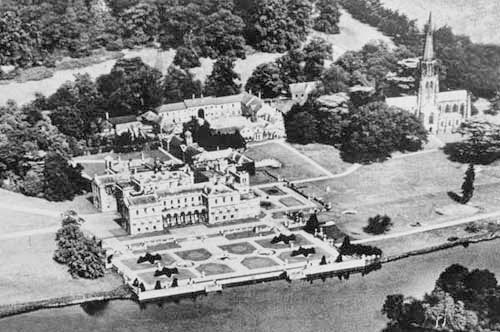 In 1938, Clumber House was demolished. A website called "Lost Houses of England" cites the reason for demolition as "insufficient wealth". Many other grand houses were knocked down in those days. Time was running out for any aristocrats who were ill-prepared for the modern world where social and political pressure for greater fairness and equality had become unstoppable. Eventually, the extensive parkland that surrounded Clumber House came under the control of The National Trust and today anybody can visit a place which would have once been out of bounds for ordinary folk. Even though the grand house has gone, the Grade One listed church remains and the stables and the ornamental lake and the estate village of Hardwick and the grand stone gates and so on. I drove over there yesterday morning and hired a bicycle which I rode for two hours through the southern section of Clumber Park - stopping occasionally to get my usual fix of photo opportunities. It was bitterly cold and I was glad I had wrapped up well for the outing - Hull City ski cap, fingerless thermal gloves, Hull City manager's jacket and lined walking trousers. I was making a significant fashion statement! The River Poulter runs through Clumber Park. Here there's a ford. "Shadow of The Beast" starring Yorkshire Pudding. Out there on the internet, thousands of my photographs are available for random strangers to view. Hosted in "geograph" and "Panoramio", these strangers are allowed to use my photos as long as they acknowledge me and my copyright. So what I am finding is that my photos will crop up in quite surprising places. "The Morning Star" is Great Britain's leading communist newspaper so as Mr R.Brague of George W. Bush Boulevard, Canton, Georgia, USA will appreciate, I was immensely proud to see my photo of a red grouse alongside a news item about grouse shooting even though I would have preferred the headline to read "Tweeded Toffs blasted to bits by Red Grouse Rebels". Thoughts crowd in. It's as if we can never escape from them. They are our constant companions, oftentimes our inescapable tormentors. Even as we sleep we are thinking for the brain has its processing work to do - work that will sometimes linger as half-remembered dreams that slip away as each new day begins. If all of the thoughts you have ever had were linked together like a Christmas paper chain, it would reach beyond the furthest edge of our universe. 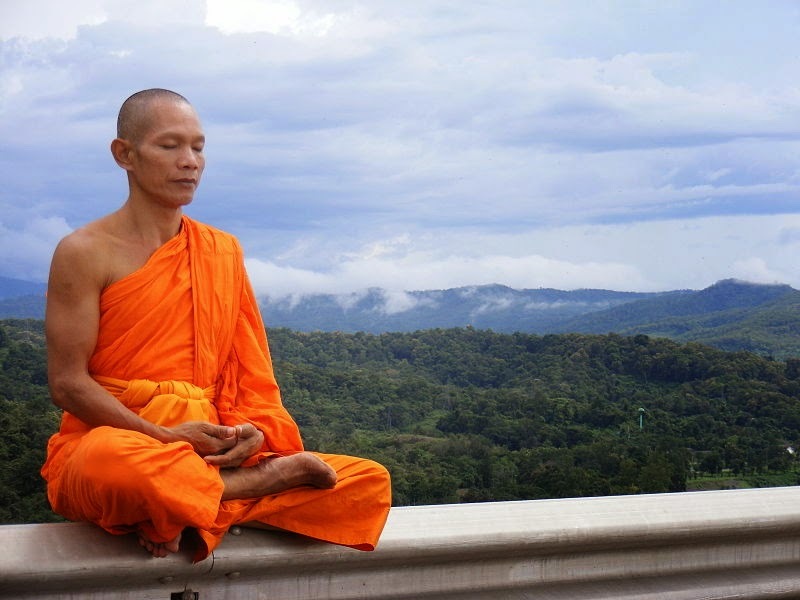 Sometimes our private thoughts appear to retreat. When we are totally immersed in an entertainment. When were are enjoying a good book. When we are blind drunk or under the influence of recreational drugs. When we are playing sport with enthusiasm. When we are in the throes of passion - what the French call "le petit mort". The little death when thoughts disappear as in "le grand mort" - the big death that lasts forever. But most of the time our thoughts are like the parrot that sits permanently on the pirate's shoulder, squawking away incessantly. "Pieces of eight! Pieces of eight!" Sometimes I'd like to grab that damned parrot and throttle it - "Leave me be! Give me some space you overgrown budgie!" 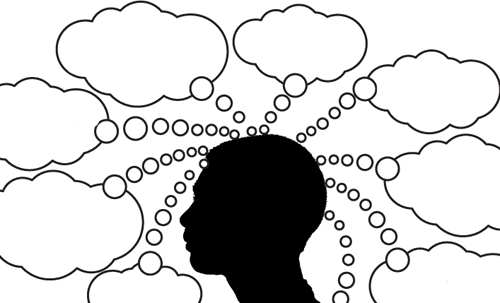 Our thoughts seem to switch fluidly from remembering distant events to very recent events. We speculate about the future. We make plans. We review what we have said or done. We review what other human beings have said or done. We consider world events. We worry about friends and families. Random images and scenes flash upon the screens in our minds and snatches of conversations seem to echo in the hallways. We fantasise. We laugh inwardly at absurdities and smile in recollection of the good things that have happened. On and on. So much thinking. There's a hill nearby with a telecommunications mast on top of it. That mast is a useful landmark. You can see it from miles around. It is like the centre of a massive compass. I drove up there today - just to get out of the house and to breathe in some fresh air, knowing that the early afternoon weather forecast was more about sunshine than precipitation. The mast overlooks both Eyam and The Hope Valley and it is by an ancient byway that takes its name from the hill it crosses - Sir William Hill Road. It is most likely that the hill was named after Sir William Saville, the 2nd Marquis of Halifax, a grandson of the sixth Earl of Shrewsbury who became Lord of the Manor of Eyam. During the English Civil War, Sir William Saville commanded Royalist forces, which occupied Leeds and Wakefield. After an attack on Bradford had been repulsed, the Parliamentarians under Fairfax forced him back to Leeds. Later, Sir William became Governor of Sheffield and was killed near York in 1644. But there are other theories for the name which I will not go into just now. It is estimated that since Roman times. the coast of Holderness in East Yorkshire has lost about two and half miles to erosion. So when you look out to sea from Hornsea or Aldbrough or Withernsea you might pause for a while to think of those lost acres of rich farming land. But more than that - out there where the North Sea waves churn in the wintertime there were villages, hamlets and even two very significant ports called Ravenser Odd and Ravenspurn - the latter being mentioned in three plays by William Shakespeare. Each winter, ruthless waves come along in storms to chew at the land. The boulder clay of the coast offers only limited resistance but in a good winter only a metre or so of land is lost to the sea. In bad winters up to ten metres might go. Some of the lost villages had parish churches and stone crosses. Graveyards and cockerels crowing from fenceposts. There were byways and lanes and humble cottages, farms and memories. People passed the time of day by their doors, hardly thinking that one day their settlements would disappear - lost forever, as if they had never been. Auburn, Hartburn, Northorpe, Monkswell, Monkwike, Waxholme, Dimlington, Turmarr, Orwithfleete, Tharlesthorpe, Owthorne, Hoton, Sunthorpe and Old Kilnsea are just some of the lost places. These names are rooted in Yorkshire's Viking ancestry. And when you walk along the beach at Hornsea you are never sure of the stories that the stones beneath your feet could tell. From more recent years you will see bricks that have been rounded by wave action - but once they belonged in the walls of barns or houses - all taken by the unforgiving sea.